"John Bull's Neutrality—The Guardian of Civilization in Full Play," cartoon by John McLenan, Harper's Weekly, September 13, 1862, courtesy of HarpWeek. 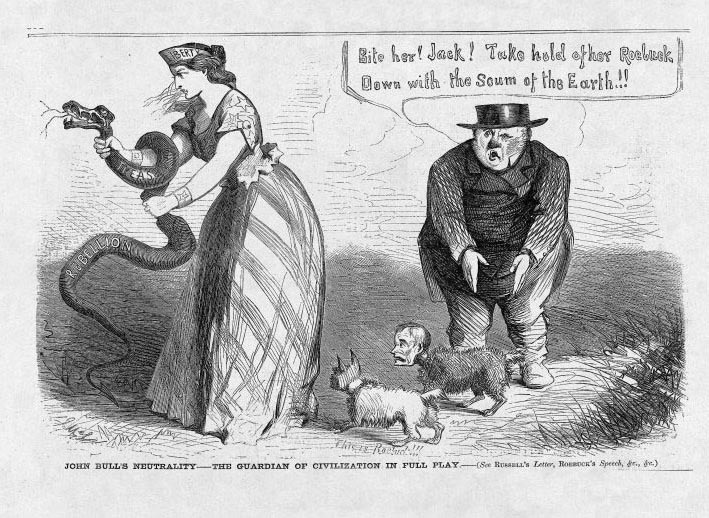 This political cartoon reflects British ambivalence towards the North and the South during the American Civil War. John Bull (a symbolic figure for Great Britain) commands his small, ineffective dogs (one representing British foreign minister John Russell and the other pro-Confederate Parliament member John Arthur Roebuck) to attack while a symbolic figure of American Liberty struggles with the serpent of treason and rebellion. In May 1861, the British government issued a Declaration of Neutrality to signify its official stance on the American Civil War. This Declaration recognized the Confederacy's status as a belligerent faction, but not as a sovereign nation. Despite this lack of recognition, Jefferson Davis and other southern leaders were confident in their ability to secure support from Britain and other foreign powers. They relied both on conventional diplomatic lobbying and on more controversial policies, such as withholding cotton, which was the South's main export to Britain. Through these tactics, southern leaders hoped to force both political and popular opinion in Europe to support the Confederate cause. Historians have long debated the success of Confederate attempts to influence British opinion during the Civil War. Many have argued that political and class allegiances determined British support for either the North or the South. According to this view, Britain's politically conservative aristocracy tended to support the Confederacy, due to the supposedly shared sensibilities of the English landed gentry and southern planters. Britain's workers and its radical middle classes, on the other hand, were seen as staunch Unionists who believed the North was a champion of democracy. More recently, historians such as Duncan Campbell and Richard Blackett have challenged this simplistic depiction, arguing that divisions over the American Civil War in Britain were much less clear-cut. 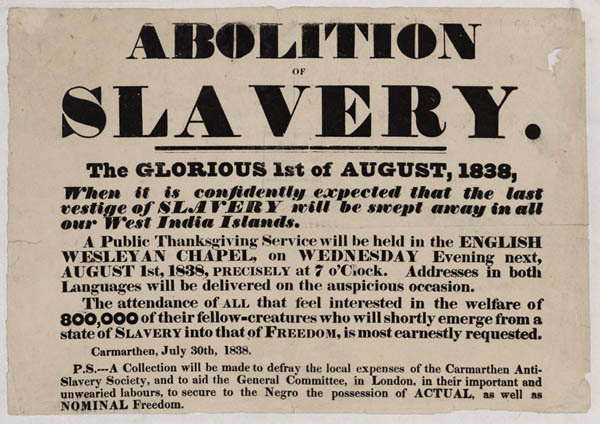 Celebration of the abolition of slavery in Great Britain, poster, 1838, courtesy of the National Library of Wales. Though the British government passed the Slavery Abolition Act in 1833, only enslaved children below the age of six were immediately freed, and only in the British West Indies, Canada, and the Cape of Good Hope in southern Africa. British involvement in slavery continued in the British Empire, including the territories run by the East India Company. Initially, enslaved people predominantly in British West Indies over the age of six were re-designated as "apprentices," and servitude was abolished in stages. The first set of apprenticeships came to an end on August 1, 1838 (as celebrated by this poster). The Act also provided compensation for slaveholders who lost their human property with abolition. By the time of the American Civil War in the 1860s, popular opinion in Great Britain widely went against slavery. Ultimately, British popular opinion was not decidedly pro-North or pro-South at the start of the Civil War. The preservation of slavery was a chief concern of the southern states in the years leading up to secession, which went against widespread anti-slavery sentiment in Britain. However, the North’s initial lack of enthusiasm for emancipation made people doubt the Union's commitment to abolition. Additionally, protectionist U.S. trade policies against British products, which were driven by northern Republicans, made many see the North as Britain's economic adversary. As a result, many contemporary British commentators were uneasy about supporting the Union, including Charles Dickens who believed the war was caused by northern protectionism. However, the popular majority in Great Britain also objected to and was disturbed by southern support for slavery. For this reason, general British attitudes towards the American Civil War could be characterized as indifferent or even disdainful towards both the North and the South. In the end, the Confederacy's commitment to slavery, and the Union's eventual dedication to supporting abolition, served to undermine attempts by Confederate leaders to win widespread popular support in Britain. Lord John Russell, photograph by John Mayall, London, England, 1861. John Russell served as England's foreign minister during the American Civil War and privately sympathized with the Confederacy. However, Russell also opposed slavery and publically favored British neutrality like many contemporary British politicians. From a political perspective, several of the British government’s leaders either privately sympathized with the Confederacy, or at least believed the South would win the war. According to various sources, this was the view held by the Prime Minister Lord Palmerston and his foreign minister Lord John Russell, but they kept their beliefs private. The government's main desire was to prevent Britain from becoming embroiled in a costly conflict. Palmerston and Russell's sympathy for the southern cause was also, like many other Britons, tempered by a repugnance for slavery that characterized both their careers. 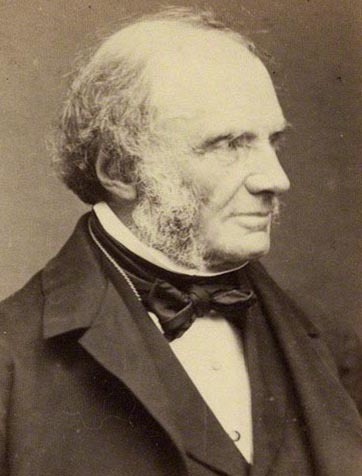 The Chancellor of the Exchequer, and future Prime Minister, William Gladstone did publically voice his support for recognition of the Confederacy, but again this represented his personal opinion rather than official government policy. Still, public opinion was not the only means of support that Confederates sought from Britain. Despite popular dissent, supplies and money still flowed from Britain into the southern states throughout the Civil War. These resources were vital to the Confederate war effort, especially following the North's imposition of a blockade against the South starting in April 1861. Obtaining a supply of goods and money from Britain required only private business relationships with British merchants and factory owners, not popular or government approval. Britain's premier port of Liverpool offered a trading environment that was favorable to dealing with the renegade states of the Confederacy, and this city soon became a primary base of southern support.